One of my favorite bloggers, fellow Minnesotan Laurel Putnam, of "Chipping with Charm" created crosses from layering two door strike plates. Laurel's post is here. Laurel made her strike plates crosses into Christmas tree ornaments for friends. I found four strikes plates today for $4. This is what I did with my strike plates. I'm not exactly sure but I think Laurel tied her strike plates together with jute and added a button, tag and a key. I added an Easter verse from Luke printed on my inkjet printer on manila colored card stock, and antiqued a bit with Old English furniture polish. I then glued the verse to the back of the "layered" strike plates. I used E-6000 to glue the two strike plates together and to adhere the verse and magnet. Thanks Laurel for the great idea! Now that is very clever! What a great idea and perfect for Easter. Gotta watch out for those! Love that idea....both of them! You 2 would make a great team! Very creative use of the strike plates. 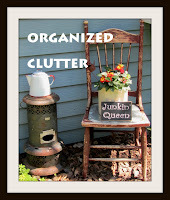 What a cute project in a rusty sort of way :) Love the lunchbox vignette. My mind JUST DOESN'T work like that! Such a simple idea... thanks for showing it. Love the rusty sweetness of the cross used as a magnet. Such an original idea. Thanks for stopping by and leaving a comment. Never would have thought of it!! How clever! I love the little verse you fit into the openings. Cute, cute, cute...the addition of the words is perfect for Easter!! I'm a little jealous of the strike plates you found...they are so wonderfully chippy...and charming ;) Thanks Carlene!! What an ingenious idea. I just love this! This is just as clever as can be. For a world of lost sinners was slain...."
Carlene...This is one of the most thoughtful and tender Easter posts I've seen. Thank you for sharing it. I love this idea...you did an amazing job on yours. Oh my gosh! This is brilliant! I love it and I wish I had saved all the old strike plates I've tossed! Nice job! That's such a great idea and I like the Bible verse in the openings. Thanks for telling how you stuck them together.